Twitter Alligator is a WordPres plugin that, using a custom widget, allows you to aggregate “tweets” from several Twitter users. There are two methods to install the plugin. You may use either one of them. The first one requires that you upload the zip file from your browser. The second one uses FTP to upload the files. In your WordPress site’s admin panel, go to Plugins. Click “Add New”. This link is located next to the page title. In the “Install Plugins” page, click “Upload”. In the file input field, browse and select twitter-alligator.zip. If the upload is successful, you should see a “Activate Plugin” link. Click that link. Extract the contents of twitter-alligator.zip. 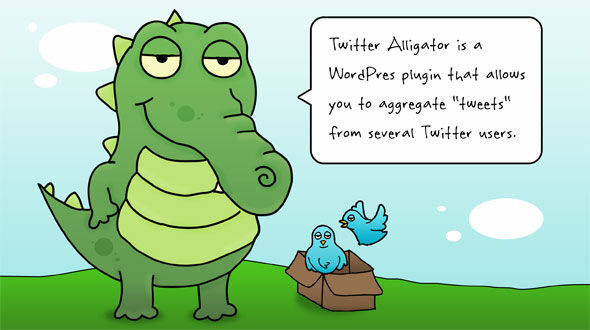 Move or copy the extracted folder named “twitter-alligator” to your WordPress site’s plugins folder (wp-content/plugins). If site is already online, you’ll need an FTP client to move the files from you computer to the server. Look for “Twitter Alligator” in the list and click “Activate”. Go to Tools > Twitter Alligator. Read the instructions on how to get your Twitter API keys. Once you have the keys, fill-out the form below the instructions. In your WordPress site’s admin panel, go to Appearance > Widgets. From the “Available Widgets” list, look for “Twitter Alligator”. Drag the item from the “Available Widgets” list to one of the widget areas on the right side of the screen. Title – Title of the widget that will appear as heading. This is common for most WordPress widgets. Users – The user IDs of the Twitter accounts whose statuses you want to display. One user ID should appear on each line. Number of Tweets per User – The limit of recent “tweets” to display per user in a set. Total Number of Tweets – Total number of tweets in a set. Date Format – The format of the date when the “tweet” was made. For format parameters, refer tothis page. It now uses Twitter API version 1.1. It now uses JSON instead of XML for tweet data storage and transmission.